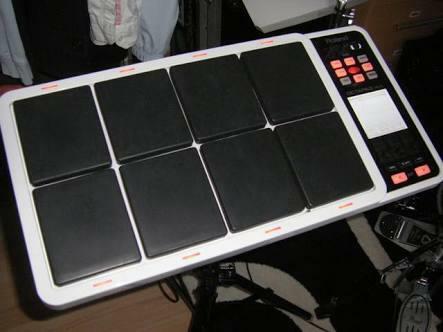 This article is about a musical instrument - rhythm pad - Roland Octapad SPD-30. I have tried to be honest and completely true to my heart in writing this article as I always do. Having used the instrument for almost 3 years I consider myself as an ideal person for writing a review about the instrument. Hope this article is useful. When it comes to rhythm pads Roland is the undisputed leader in manufacturing rhythm pads better than any other brand in the world. Musicians around the world are fully inclined towards using Roland instruments when they are looking for rhythm pads. What is the reason behind it is not very alarming or head turning, it is the quality, reliability and the easy to use formula which has given a sense of confidence in the minds of the customers who use Roland products. Over the years Roland has brought considerable innovative changes to the instrument which has a lot of meaning in it rather than merely changing the shape and size of the instrument. The Octapad legend started almost 30 years ago when the first "OCTAPAD" THE PAD 8; Roland's revolutionary percussion instrument was announced in 1985. This instrument was immediately adopted by musicians around the world not only for playing drums or percussion instruments but also using it to perform all styles of music. The year of 1988 saw the addition of Octapad II which was also thoroughly successful. The years 1990 to 1998 saw three variant changes in the instrument, the introduction of the SPD series for the first time, in the concluding years Roland brought SPD-8, 11 and finally 20. The SPD 20 was immensely popular among musicians around the world and musicians not using SPD-20 were a rarity. Anyone who used a rhythm pad used an SPD-20; such was the dominance of the instrument in the musical world. 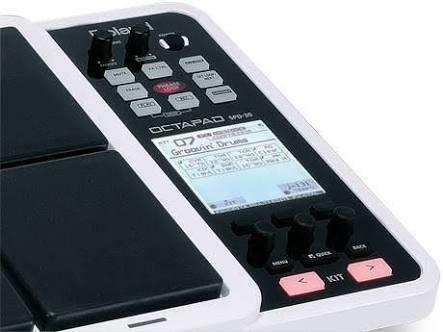 Now the year 2010 marked the comeback of the original instrument the Octapad SPD-30 for the 21st century. While maintaining the basic design of the precedent models, this new Octapad features a large display, a friendly user interface, cutting edge sounds, effects, USB MIDI, and the latest pad-sensing technology developed for the V-drum series. The most exciting and the evolutionary step of the new Octapad is the "Phrase loop function" which helps in turning your inspiration into sound, meaning you can create your own rhythm loops and layer your performance on top, all in real time. 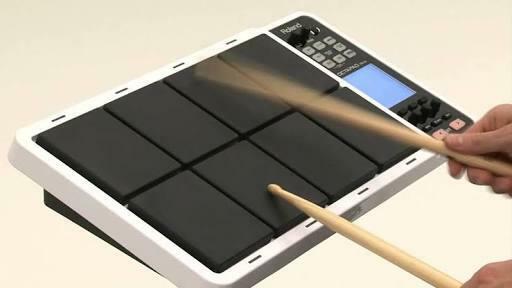 That alone enhances the potential OF THE 8 PADS on board and expands the playable combination of percussion instruments. What would you expect from a musical instrument? The design has to be appealing enough for you to be noticed on stage and also compact enough for carrying around for your frequent concert schedules. 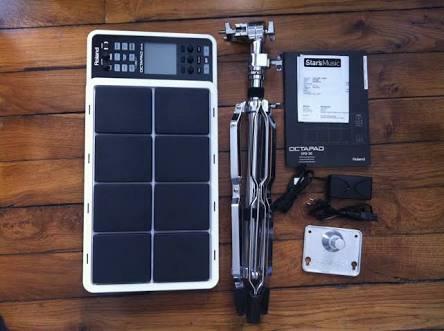 The Octapad SPD-30 fills all the requirements for you. For me I feel the SPD-30 is best looking rhythm pad till date and the best design Roland has been able to bring into the market. The colour, the overall design, the screen, the pad illuminator, the switches and knobs all have been meticulously crafted and designed by the Roland designers. Full credit goes to them for this marvellous work done on the instrument. The best design I have ever seen. The 8 pads on board are away from each other and you will not hit the wrong pad while playing. One of the most striking features of the design is the pad illuminator given at the top and bottom of the 8 pads, which by enhancing the awesomeness of the design also helps in playing in completely dark conditions. The illuminator lights up when you hit the pads while playing. What musicians did not like in the old SPD-20 was the screen and they have been craving for a good screen. Roland here accessed the situation best and brought up a good screen which is handy for such a screen oriented instrument. The SPD -30 has a large TFT screen which helps in using the instrument with ease. The power button, the knobs and the switches are carefully designed so as to have that user-friendly nature. I would give 4.8 out of 5 stars for the design alone. The only thing I wish was present on the instrument was a touch screen which would have made the navigation a bit easier. Apart from it, you should not have any complaints against the design. Any electronic instrument should have a user friendly User Interface and when comes to a musical instrument if you don't get the user interface it is going to be nightmarish experience for you. In SPD-30 Roland, there has been hard work on making the instrument user-friendly, but the complexity of the instrument is such that no matter how hard you work on making it user-friendly it always will remain a little complex. The main Kit screen as it is called is relatively simple and the button given at the bottom helps in navigating through the kits easily, but when you need to change any setting then you need to be very careful in pressing the right button and navigating through the right menus, if not, matters may become worse. One of the major issues people speak of about is the complexity of the instrument and I would like to say even the computer guys should not take the User interface of the SPD-30 for granted. What is the last word? Is it far more complex for a common musician to understand? Not at all but it is not simple either. You need to invest time on it to really understand the overall functioning like Phrase loop and other important functions of the instrument thoroughly. There are no words for me to really describe the sound quality of SPD-30. It is superb, fantastic, realistic and really awesome. A truly trained drummer can really generate the most out of it. The sound engine used in the SPD-30 is the same used in the original V- drums as claimed by Roland and that may be the reason behind its realistic sound quality. I am not exaggerating my views but it is what it is. Real Indian sound kits are loaded on the new version and you can demand it while purchasing if not preloaded. The touch sense on the pads is superb this time around and helps in hitting the pads with varied amount of force and that results in different sound generation. The well-designed settings panel helps in being in control on stage or during your performance. The Phrase Loop function is one of the defining features; you can record, play and overlay your performance all at same time. I would recommend you laminating the instrument at least on the pads otherwise it will get worn out after continuous playing. The rubber on the pads will reduce in size and patches will form on the pad which will be a bit annoying. So if you spend almost 55ks for your SPD-30 do not forget to laminate it by spending a little more. I have been using this instrument for the past 3 years and have enjoyed every bit of journey with my SPD-30.I just love it. As it is a Roland instrument it is of course the best in class in case of build quality. One of the unfortunate things which happened with me is that last year the screen of my Octapad went a little bit dark and a big line was visible from the middle top to bottom, don't know how it happened, I did not take it to any service centre because there is nothing wrong with the screen in its overall display. So that may be a thing you should remember while taking care of the instrument. Apart from this the build quality is best in its class. No issues whatsoever. Superb build quality, Amazing sound, well-integrated Pad illuminator, well-distanced pads, light weight design, and additional ports for other drum kits, large display, and Compact design. This is a small account of my personal view on the rhythm pad Roland SPD-30. Hope it useful guys. Play and enjoy. God bless. This article is about the musical instrument the Keyboard KORG professional arranger 300. I have tried to be honest in my review as I always do. This review being of a musical instrument I have given as much information I can from a musician's point of view. Hope the musicians around will be able to extract enough knowledge from this article to be acquainted with the instrument. Hope this article is useful. This is a brief review of the musical instrument Roland Handsonic HPD-20. In the age of drums and rhythm pads, Roland brings one of the uniquely designed percussion instrument to the fore. In this review I will explain some important features, sound quality, build quality and Pros and Cons of this uniquely designed instrument. Hope this review is useful in understanding the instrument. Mackie brings the Pro FX series mixers at a reasonable price point for anyone looking for great sounding mixers from the company at relatively low price. Here I would love to review the sound mixers in the series and get you acquainted with all the four mixers in the series. It is a good move by the company to bring such a good deal. This is my personal view of all the four mixers in the series. Hope this helps. Sampling pads form a very important accessory of percussion instrument because of its very easy to use formula and the dimensions it can work along and give performance the must needed gel-up. Here I am reviewing this new Alesis Sample Pad Pro. It has a lot of potential to bring a lot of sounds and styles to your normal percussion playing. Hope this article is useful. Hi, thanks for the review. You're mentioning laminating the pads. How do you do that, what do you use for that?